At Natures Images, we always select the right time and the right locations, working with the best wildlife photographers and guides in the business. 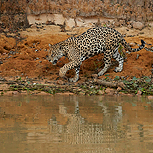 When it comes to iconic locations and species in the world then Jaguars in the Pantanal area of Brazil are right up there and this trip offers the ultimate opportunity to focus on these magnificent felines in undoubtedly the best place in the world to do so. Operating from our small open boats with a row for each photographer and with the additional support of an expert local biologist and jaguar expert our days out will be long but focussed as we look for intimate photographic encounters away from the crowds. 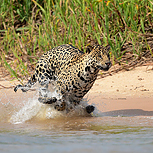 Unlike many trips which explore other areas of the Pantanal, this will be highly focussed and we will spend our entire time-based in prime jaguar territory which will result in over 9 days of photography here; on our latest trip, this resulted in over 50 encounters during our time here. We will of course experience the additional wildlife wonders of the region here as well with Giant Otters, Hyacinth Macaw, Cayman, Capybara and an array of other bird species in particular as a supporting cast too, it is a trip that offers an amazing wetland experience. Day 1: We leave our destinations in the evening for our long journey to Sao Paolo in Brazil. Day 2: We will arrive in Sao Paolo in the morning and after a transfer across the city will catch a second internal flight to the city of Cuibar where we will meet our locally based guide Pablo Cerosimo at the airport. To maximise our photography time in the Pantanal we will get straight on with the long transfer drive to the settlement of Porto Jofre which is in the heart of the Pantanal’s river systems at this time of year. We will arrive sometime in the evening in time for a quick bite to eat and a very well earned nights sleep. Days 3 – 11: Throughout the trip we will be based in a small and intimate lodge with just a few rooms but perfectly positioned for our boat-based activity. The pattern for each and every one of the full 9 days of photography we will have here will be similar: up early for the best of the light and heading into the river systems where, dependent on how things progress each day we will generally return to the lodge for a short rest during the middle of the day when the heat is at its greatest and the light its harshest. Our goal and approach is simple: we are looking for Jaguar and quiet intimate encounters with them which means most of the time avoiding the crowds in search of higher quality experiences. This approach has served us well in the past with extended and engaging encounters every day. There will be other species we will see and photograph of course as we are there for the full experience and so Giant Otter in particular will also be high on the agenda. There will be birdlife around us almost all of the time, so it will be a full on and varied trip photographically for sure but with the main focus of jaguars underpinning it at all times. Day 12: After a final morning excursion if time schedules on the day allow, we will drive back to Cuiba and spend the evening in a hotel there in preparation for our long journeys home. Day 13: In the morning we will be leaving our base here early and arriving back in Sao Paolo well in time for connecting flights in the afternoon back to Europe which will arrive the following morning. Day 14: Arrive back in the UK/Europe. All transportation, local guiding, accommodation, and meals. International and domestic flights to Cuiaba (precise recommended schedules will be advised once available for booking), sundry items and alcohol. Our accommodation throughout will be a combination of comfortable hotels and lodges. Rooms are on a twin basis; single supplements may be possible in some locations on request but given the small nature of the lodge we are based at are not guaranteed and very pricey! This is a fairly active trip in terms of time out and the impact of the heat/sun so a good level of stamina is required even if there is not much physical exercise involved.